Microdermabrasion is a non-surgical exfoliating treatment that will improve the texture and appearance of your skin. 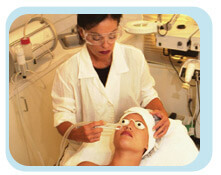 Microdermabrasion has been available in Europe for many years, and has recently arrived in America. It has now become one of the most popular exfoliating facials in the country today. During a Microdermabrasion treatment, a fine spray of medical-grade corundum powder crystals is showered onto your skin. These crystals are then gently suctioned away, along with the old, dead skin cells, leaving a fresh and glowing appearance. At the end of your treatment, you will be absolutely amazed at how soft and smooth your skin looks and feels! How will Microdermabrasion improve my skin? Microdermabrasion is inexpensive, comfortable and essentially risk-free. Your skin is left deeply cleansed, smooth and pre-teen pink. It is also an excellent acne treatment because the crystals help extract oil from the skin. One of our aestheticians will be happy to sit down with you at no charge, discuss your skin concerns and goals, and select a treatment program to get you there at a reasonable cost. Our office provides the service by a licensed aesthetician, supervised by a physician, for just $99 each visit. And, since many people get “hooked,” treatment packages are available for a discounted amount. “I have been going to BodyLase® religiously every four to five weeks for the last few years for microderm-facials and it’s always a great experience. The front desk staff are so welcoming and nice and Kelly is by far the best esthetician I’ve ever had. She makes every treatment feel like a full blown spa day. She’s super knowledgeable about skincare and products and after taking her advice on a few product recommendations, my skin is looking great. And like any great service provider in the aesthetics industry, she can always sense whether I want to chat during my treatment or when I just need to relax. 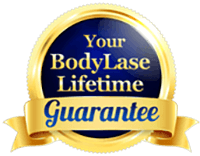 I look forward to my time with Kelly every month!” –Heather S.
To schedule your appointment please call BodyLase® a at one of our two convenient locations.